Hannah Weiland’s second London Fashion Week collection stood out on Friday’s jam packed schedule. Star Trek met The Wizard of Oz for the Fall 2015 collection which was held at the BFC Presentation Space which branched off the River Terrace at Somerset House. Inside the show space which resembled a starry night from floor to walls our Dorothy was a faux fur clad, red lip wearing beauty. 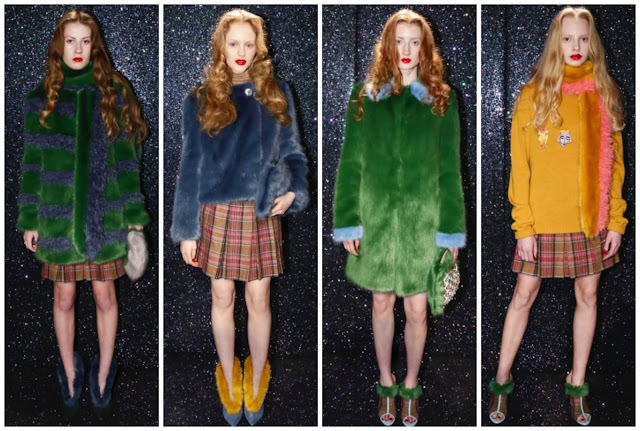 Outside the presentation PR’s and fans were dressed in Weiland’s now iconoclastic faux furs. Their colourful hues were eye catching and displayed how fans of the brand are loyal and looking forward to seeing what was on offer. They were in luck. Emerald green for the Emerald City and bright hues of yellow and mustard for the Yellow Brick Road which Dorothy & Co. parade upon. The lion-like tangerine colours could be the Cowardly Lion’s mane or the straw of the brainless Scarecrow and shimmering silvers the heartless Tin Man. Contrasting aquas lined canary yellow coats and grey-blue jackets with pink and red kilts. Childlike illustrations were emblazoned on some of the sweaters and clutches. 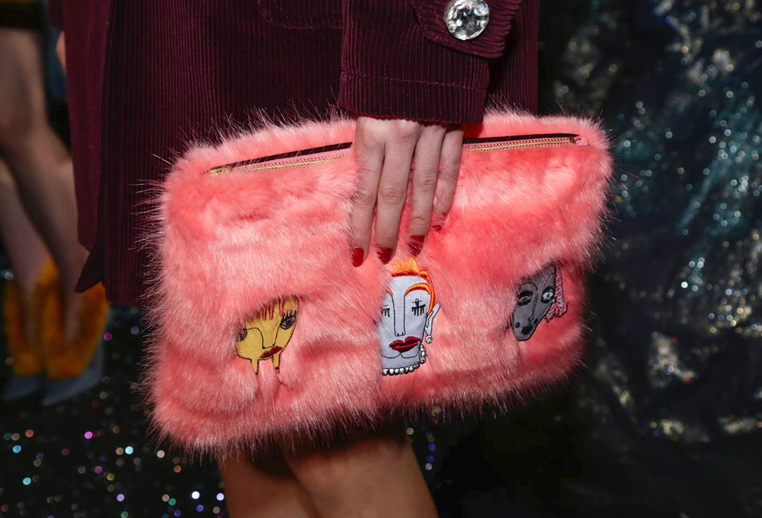 Multi-coloured beaded clutches were a standout accessory. The 13 piece collection was luxurious. No animals endangered in the production of the brilliant furs which Weiland puts a unique spin on each season. One might say that faux fur coats season after season will become monotonous. Nay. Fie upon on that thought. Different colour codes, branching into other outerwear such as kilts and wool sweaters is a sustainable and fashion-forward direction. Creation of kitsch accessories is also a talent which Weiland has acquired from her experience in the fashion industry. This animated display on the opening day of LFW was memorable and sartorially so.